The great majority of lifters place their feet a short distance apart for the Press. A few place the feet together and a small minority take up a very wide stance. The Germans, in particular, advocate the feet together position and their great lifters Manger, Ismayer, and Wagner used this style. 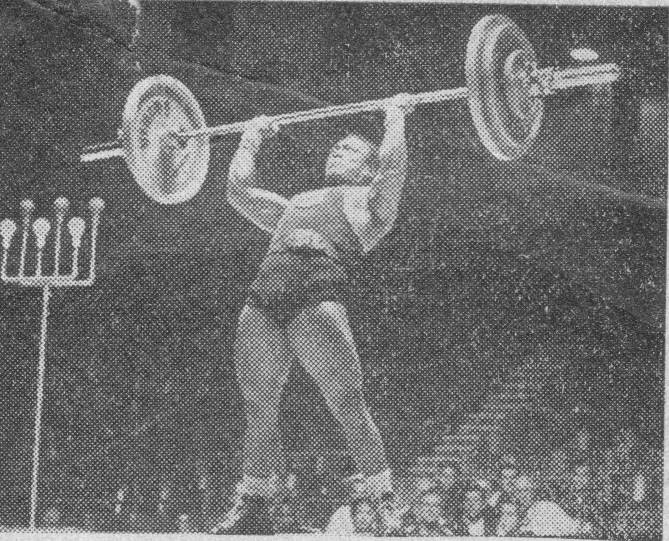 Alf Knight is the best known lifter of today who presses like this. It is argued that this style enables the lifter to preserve an upright stance, because the closed position of the legs fixes the pelvis and makes it easier to tense the thigh and buttock muscles. There muscles act like stay wires to keep the lower part of the trunk fixed. But this rigid fixing of the thighs and lower trunk is not suitable for the modern style of pressing. This is a point which will be enlarged upon later. Another disadvantage of the closed feet position is that the smaller base is less stable than the wider base provided by the feet astride position. Probably the widest stance of all is used by Salmassi of Iran, who holds the Olympic Games featherweight record with 220.25 lbs. Another outstanding presser who favors a wide stance is Rodriguez del Rosario of the Philippines, who has exceeded 230 in training. 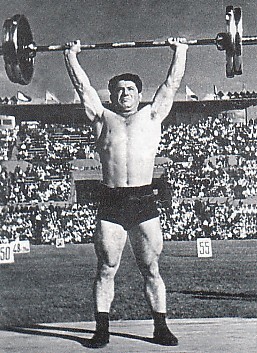 Johan Runge, holder of the Scandinavian Press featherweight record (220.25 lbs. ), also stands wider than most. Other wide-standers are John Stuart, Phil Caira, Mahmoud Namdjou and Issy Bloomberg. We advise all lifers with small feet to take up a wide stance, because they will then find it easier to balance. Modern pressing styles require certain delicate movements of the hips and ankle joints, and these cannot easily be done in the old, rigid, feet-together position. Next time you see a good presser in action, instead of watching his arms and the bar, watch his ankles for a change. You will be surprised at the amount of movement that takes place there. Previously it had been mentioned that you should get your Clean over as quickly as possible. Practically everyone cleans the bar with feet astride. Moving the feet together after the Clean means that you are holding the bar at the shoulders a little while longer. You also have to readjust your balance. These two delays keep you waiting longer before actually pressing, which is not a good thing. We apologize for dragging in the following rather abstruse mathematical considerations to such a live subject as weight-lifting, but it is necessary to outline these points so that you may follow more easily the information which will be given in later articles. It is rather surprising, however, that little or nothing of this information has been published before, because engineering principles are very much concerned in the business of raising weights. 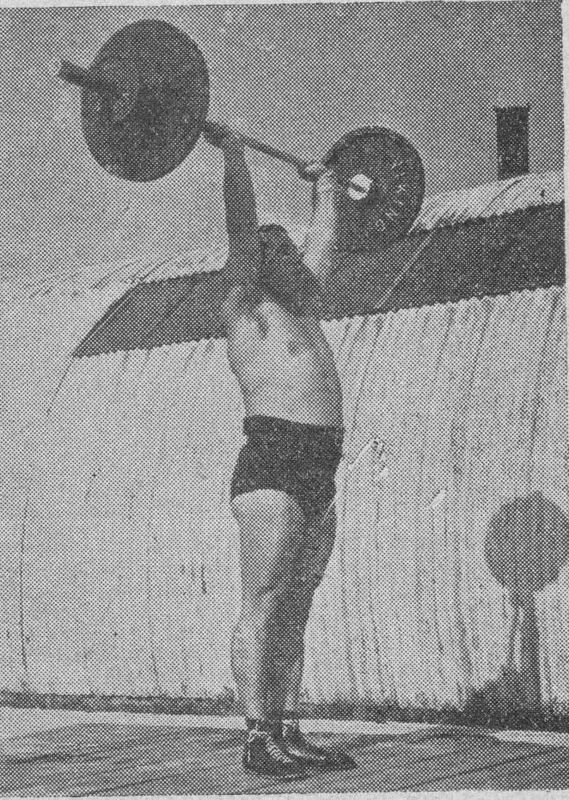 The ultimate object of all styles of weight-lifting is to finish with the bar at arms' length overhead, where it must be held for two seconds. Therefore, the finishing position must be one of perfect balance. Perfect balance is achieved by a correct distribution of the body and the barbell above the base, i.e., the feet. To this end, the center of gravity must be vertically above the base. Normally when a man is in an upright position, his center of gravity is mid-way between his hips. It varies a short distance up or down in accordance with the type of physique. The wide-shouldered, deep-chested man, with slim waist waist and tapering legs like Steve Reeves will have a higher center of gravity than a type like Grigori Novak, who has a straight trunk and enormously thick thighs like young oak trees. Novak's center of gravity will be lower than that of the average man. Figure 1 - L = Center of Gravity of the Lifter. - B = Center of Gravity of the Bar. - C = Combined Center of Gravity. Note that L is in mid air, and that c is on a vertical line passing through the instep. Figure 2 - Note that L has returned to its normal position and that C, the operative center of gravity, has moved up into the chest. C has been calculated on the assumption that the barbell weighs 250 lbs and the lifter 150 lbs. With all three centers of gravity on the same vertical line passing through the instep, an ideal balance has been achieved. Figure 3 - C has now moved up into the head and perfect balance is necessary to prevent this top heaviness from getting out of control. Note that in order to get all three centers of gravity in line, the hips have been eased forward. These drawings are based on actual photographs. A complication arises as soon as a lifter grasps a barbell. 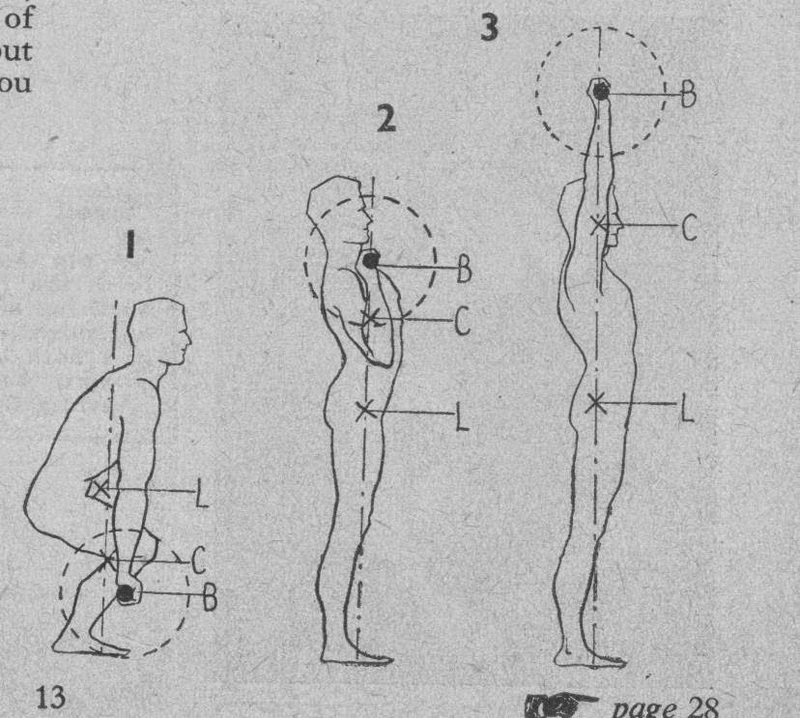 The bent-up position of the body causes a redistribution of the body-masses and the lifter's center of gravity (C.G.) actually moves outside the body for a point just in front of the hips (see Figure 1). At the same time, from a mechanical point of view, the barbell now becomes a part of the whole mass. The C.G. of the barbell is the mid-point of the bar. A third C.G. which we shall call the combined C.G. is located between the other two and is proportionately nearer the heavier mass, normally the barbell. The exact location of this combined C.G. can be worked out mathematically but we will not bore you with that. Suffice to say that it is somewhere between the two original C.G.'s. Thus in this get-set position the combined C.G. will be a little farther forward and lower than the lifter's C.G. It is imperative that this combined C.G. should be vertically above the instep. If you sit too far back from the bar your combined C.G. will be over the heels, which means an unbalanced position and a tendency to pull backwards in the lift. Conversely if you lean too far forward, your combined C.G. will be over the toes and a forward unbalanced pull will result. You will find that a slight forward set of the shoulders will give the best balanced position and will locate the combined C.G. directly above the instep. As soon as the lifter begins to lift the bar, the body rapidly alters its position and the whole mass continues to redistribute itself. This automatically alters the positions of the three C.G's, but the combined C.G. is the operative one from now on, and its location will determine whether the lifter is in a balanced position or not. Thus when the bar arrives at the shoulders at the end of the Clean, the situation is shown in Figure 2. Owing to his having resumed the upright position, the lifter's C.G. has returned to mid-way between his hips. The barbell's C.G. is always constant, i.e., in the middle of the bar. The combined C.G. will be at a point between these two and the heavier the bar, the higher the combined C.G. As the bar is pressed overhead the combined C.G. 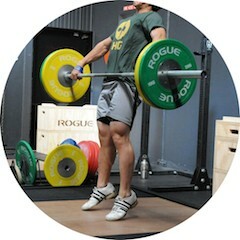 also moves upward a proportionate distance and when a lifter has a double bodyweight Jerk overhead, the combined C.G. will be very near to the top of his head. This high center of gravity tends to make the whole mass top-heavy and perfect balance becomes a vital necessity. Owing to the relationship between these three centers of gravity, the best balanced position is obtained when all three C.G. 's are on the same vertical plane passing through the instep (see Figure 3). From this it follows that in all lifting movements, every endeavor should be made to bring the three centers of gravity into the same perpendicular line. This is a fundamental principle with importance that cannot be overstressed and we shall return to it again and again in future articles. There are two ways of bringing the C.G. 's into one vertical line. You can either maneuver the bar to a point above the C.G. of the body, or you can maneuver the body C.G. below that of the bar. 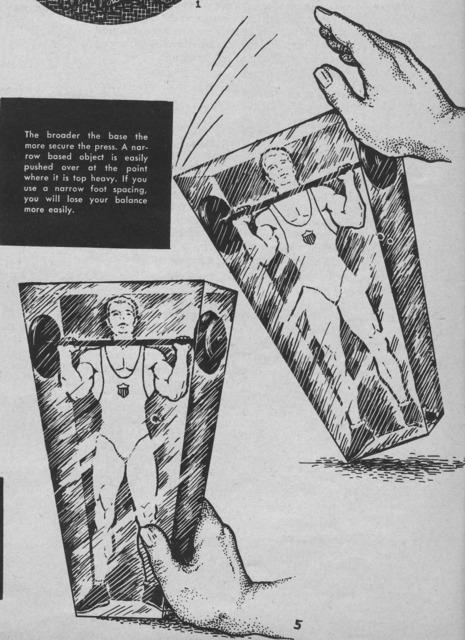 Of the two methods, we definitely advocate the latter, i.e., you should get your body under the bar, even in the Press. Mechanical evidence at once makes it obvious why this is the better practice, particularly when you are handling a poundage in excess of bodyweight. Say, for example, a ten stone (140 lb) lifter is hoisting 180 lbs. It is much easier to adjust his 140 lbs bodyweight slightly forward under the bar than it is to move the 180 lb barbell backwards over his body. Furthermore, bringing the bar back over the body means that greater force has to be exerted to check the original upward movement, and to change an upward movement, and to change to an upward-backward movement than is required to keep the barbell moving in its original upward direction. One original cause of the bar "sticking" in the Press is this change of direction. The check on the movement upward in order to change direction is sometimes more effective than the lifter may realize and the bar may be brought to a dead stop, which is, of course, fatal and results in a "No Lift." Also, you will remember from last month's article (see link below) that the sticking point occurs as the elbows turn outwards owing to the shoulder articulation, and the change over in muscular action. As the change of direction usually occurs at about the same time, the combined results are even more fatal, and the lifter, frustrated by three adverse factors, finds the bar going down, t'other way.